There are few football clubs in the world with a history as captivating as Athletic Club Bilbao. Globally, the club is famous for its unique transfer policy of only signing players born or developed in the Basque Country and as one of only three clubs never to have been relegated from La Liga. To maintain these proud traditions and records takes passion and commitment, a fire that burns deep within. Because things have happened to Athletic Club Bilbao - to its players, its city and its people - that make it unique. Somos diferentes, as they say in Bilbao: we are different. There are hundreds of stories that help to explain why. One begins on 21 May 1937, in the midst of the Spanish Civil War. Nationalist forces, led by Franco and supported by Hitler and Mussolini, were closing in on Bilbao, a centre of industry and commerce, and a strategically important city in the struggle for the future of Spain. José Antonio Aguirre, President of the Basque Country, stood on the waterfront in the port of Santurtzi, a few miles north of Bilbao. As the wind whipped in from the coast, Aguirre watched a seemingly never-ending line of children board the SS Habana steamship docked on the Nervión river. It would soon depart for England, the conflict having forced parents to make the agonising decision to send their children away to safety. Aguirre had once played as a midfielder in the red and white stripes of his beloved Athletic Club. Now he had responsibility for the life-or-death decisions of a leader during wartime. He had worked tirelessly to find countries willing to accept Basque refugee children and was grateful for the support shown by Leah Manning, the Secretary of Britain’s Spanish Medical Aid Committee. Manning’s efforts to organise the children’s evacuation had not been well-received by many of her country’s leaders. Publicly, Britain remained non-interventionist during the Spanish Civil War but most in government felt that a victory for Franco’s Nationalists would be in Britain’s best interests. Faced with Britain’s reluctance to involve itself in the affairs of another nation, Manning’s passion and persistence became integral to the safe evacuation of the children. The SS Habana carried around 4,000 people when it set off from Santurtzi. Over 3,800 were children, many as young as seven years old. It took three days to cross the Bay of Biscay’s rough seas and most of the children suffered violent seasickness. Each child wore a hexagonal piece of cardboard on their chest with a number written on it. Raimundo Pérez Lezama, aged 14, was assigned number 2706. On reaching England, Raimundo and his younger brother Luis were two of thousands sent to a temporary camp north of Southampton. The majority were from the industrial inner city of Bilbao and their new environment came as a shock. The younger children were understandably distressed. The older ones, like Raimundo, were also aware of the political backdrop to their exile and anxious to hear from their families. The news was not what they hoped. Bilbao fell to the Nationalists on 19 June 1937, a month after the children had left. In The Spanish Civil War, his landmark book about the conflict, historian Hugh Thomas wrote: “The news of the fall of Bilbao was given by a priest to the Basque refugee children in England at their main camp at Stoneham (Hampshire). The assembled children were so appalled that they fell upon the bringer of such bad tidings with stones and sticks. Three hundred children out of the 3,500 broke out of the camp in grief-stricken purposelessness”. Raimundo and Luis were split up. Raimundo remained in Southampton and attended school at Nazareth House, a converted children’s home where lessons were led by nuns. His talent for football soon caught the eye of a director at Southampton. Raimundo joined another Basque refugee, Sabino Barinaga, in signing for the club. The pair flourished at either end of the pitch for Saints’ youth team, Sabino a sharp-shooting striker who scored 62 goals in one season while Raimundo impressed as a goalkeeper. The team scored 277 goals in 33 games, conceding only 17. Just a year into his football career, Raimundo’s life was again affected by conflict. The outbreak of the Second World War consumed British society and the fate of the Basque refugee children appeared to lose importance to the Westminster government. The Spanish authorities, now under the Fascist rule of Franco, were keen for the children to return home. Sabino left on 16 January 1940 along with his two younger brothers and Raimundo’s younger brother Luis. Six months later, Raimundo left to be reunited with his family after three years in England. Of those who stayed in England, some would go on to play in the Football League for teams such as Coventry and Norwich. In different circumstances - had the civil war not happened, had the ship not left, had they been forced to return - they may have fulfilled many Basques’ dreams of playing for Athletic Club. Raimundo Pérez Lezama initially played for three months with Arenas Club de Getxo, just across the river from where the SS Habana had set sail three years earlier, thanks to a friendship between his father and a director at the club. It quickly became clear he was destined for bigger things. Lezama signed for Athletic Club. Having been number 2706 on board the Habana, he became number one at Spain’s then most successful football club. At just five feet and ten inches tall, Lezama had to compensate for his relative lack of height through agility and ability. He was one of the first ‘sweeper keepers’, quick to rush out of his goal to clear danger. He also proposed revolutionary English tactics or training methods to his coaches in Spain, often to be met with derision. 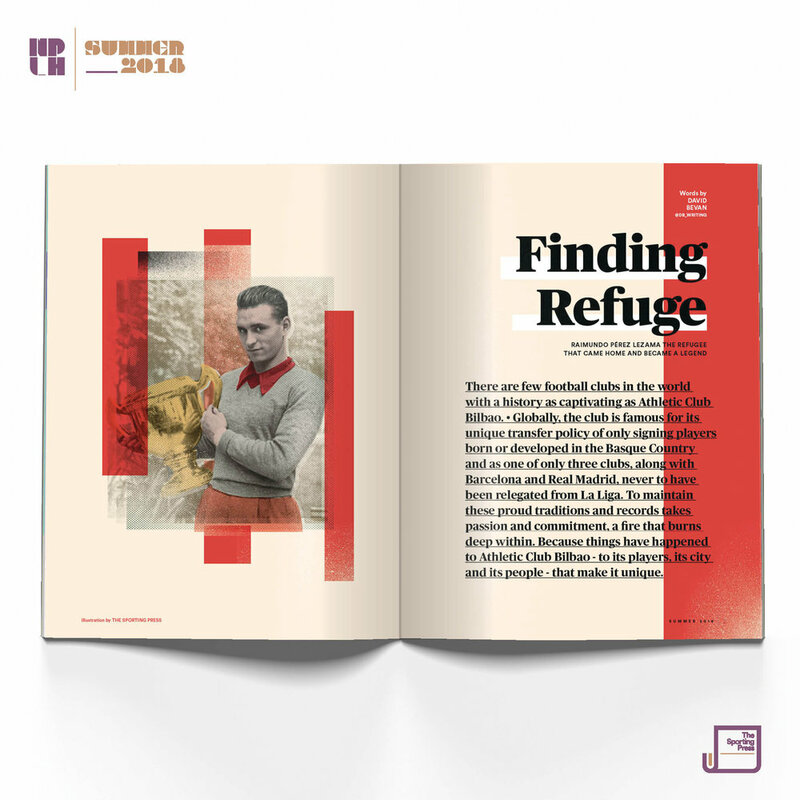 In truth, Lezama’s experience as a refugee had placed him years ahead of his time in football terms and Spanish teams would later adopt many of the practices he had advocated as a teenager. Spain’s neutrality in the Second World War meant Lezama’s football career was unencumbered by the global conflict. He stood between the posts during a golden age for Athletic Club, in 1943 helping them win La Liga and the first of three consecutive Copa del Reys. Lezama spent sixteen years at the club, making over 250 appearances, before his departure in 1957. He passed away in 2007 at the age of 84. Today, Bilbao is a thriving modern city that pays tribute to people who endured struggle in its past. In the centre of the city, close to the Plaza Moyua, there is a statue of José Antonio Aguirre. He is dressed in a long overcoat, clutching his hat to his midriff in sombre fashion, just as he might have done when sending the children off to England over 80 years ago. To the north of the city is the suburb of Txurdinaga, a smart residential area with some architecturally interesting tower blocks. One of the spaces between these huge structures, unremarkable on first glance, is the Jardine de Mrs Leah Manning, named after the British woman who organised the evacuation of the Basque refugees. Fading pastel chalk drawings on the ground are a fitting mark of children who were fortunate to grow up in peaceful times. Further east of Bilbao lies Athletic Club’s famous Lezama youth academy and training ground. Although it bears the same name and many believe it to be named after Raimundo, it is a happy coincidence that Athletic Club chose to situate the facility in the village of Lezama. Throughout the year, hundreds of children play football on one of the many pitches set in the peaceful valley. They are untroubled by war, free to play and pursue their dream of representing Athletic Club. Some will know its history, will have heard stories of Lezama and Aguirre and hundreds of others who have made the club what it is today. All will have been to San Mamés. The curve of Athletic’s breathtaking stadium in Bilbao mirrors the bend in the Nervión river below, a few miles south from where the SS Habana docked in 1937. Thousands make their way to San Mamés every other week with hope in their hearts. It is a fitting place to remember someone who shared the same passion for the club but had more difficult journeys to undertake. There, outside the stadium overlooking the river, a street sign bears the name of Raimundo Pérez Lezama - the child refugee who became a legend. Sign up with your email address to receive news on our latest releases.